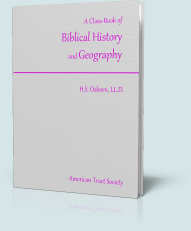 A Class-Book of Biblical History and Geography, by Professor H. S. Osborn, LL. D., published by the American Tract Society, 1890. "This work is a Class-Book of the Old and the New Testaments treated as consecutive history. It includes the Jewish history of the centuries between the close of the Old Testament and the beginning of the New... It presents those important elements of Biblical history which distinguish it from all other histories and which illustrate the plan and the purpose of the Bible as one Book... In the treatment of this history we have allowed no space for mere opinions or speculations. The work is purely historical, and its text is illustrated only by that which is pertinent and well authenticated, in either geographic or archeological discovery." 1-1. Creation, Eden - Chronology and its Sources. 1-2. The Significance of Names. 1-3. The Descendants of Adam. 1-4. The Lineage of the Patriarchs. 2-1. The Two Ararats. The Sons of Japheth. 2-2. The Sons of Ham. Their More Recent Names. 2-3. The Descendants of Shem. Job. 2-4. The Confusion of Tongues. 2-5. The History of Abram and his Times. 2-6. The Patriarchs Isaac and Jacob. 3-1. The Israelites in Egypt. 3-2. The Physical Geography of Sinai and the Desert. 3-3. The Entrance into Canaan. 3-4. The Battles of the Conquest. 3-5. The Introduction of Idolatry. 4-1. The Nature of the Office. The Chronology. 4-2. The Scribes of the Age. 5-1. Origin of the Monarchy. Reign of Saul. 5-2. The Reigns of David and of Solomon. 5-3. The Division of the Kingdom. 5-4. Analysis of the Reigns of Judah and Israel. 5-5. The Institution of the Prophetical Office. 6-2. The Comparative Religious Spirit. 6-4. The Canonical Books. Samaritan Pentateuch. 6-5. What Was Scripture. The Septuagint. 6-6. The Origin of the Talmud. 6-7. Concluding Remarks on Period VI. 7-1. From the Birth of Christ to His Public Ministry. 7-2. The Public Ministry of Our Saviour. 7-3. From the First Passover to the Second. 7-4. From the Second Passover to the Third. 7-6. The Beginning of the Christian Church. 7-7. The Gospel for the Gentiles as Well as the Jews. Paul's First Mission. 7-8. The Second and Third Missionary Tours of Paul. 7-9. Paul at Rome. The Seven Churches. Colosse and Hierapolis. 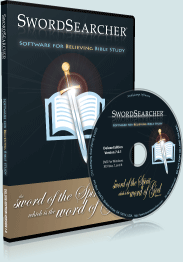 As with all library material in SwordSearcher, Osborn's Class-book of Biblical History can be instantly searched and is also accessible by Bible reference.